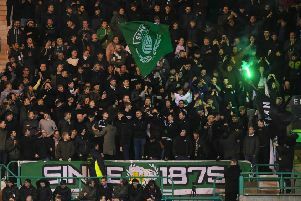 Hibs return to Premiership duty this afternoon following the League Cup quarter-final defeat to Aberdeen on penalties on Tuesday night. Head coach Neil Lennon makes three changes with captain David Gray, Daryl Horgan and Thomas Agyepong all in the starting XI. Dropping to the bench is Oli Shaw while Martin Boyle (bruised foot) and Paul Hanlon (dead leg) miss out completely. Hibs (4-1-4-1): Bogdan, Gray, Ambrose, Porteous, Stevenson, Milligan, Mallan, Hyndman, Horgan, Agyepong, Kamberi. Subs: Laidlaw, Whittaker, Bartley, Shaw, Nelom, Slivka, McGregor. St Mirren (4-2-3-1): Samson, P.McGinn, Baird, Ferdinand, Hodson, Flynn, S. McGinn, MacPherson, Edwards, Smith, Jackson. Subs: Lyness, Heaton, Kirkpatrick, McShane, Willock, Erhahon, Jamieson.